Turns out it wasn't even a contest! 59-20 Ducks! I was thinking about you when the match-up was announced and then kept forgetting to check here! OSU had a pretty rough year until we were forced to go with our freshman QB because of injuries. We upset Oklahoma to just get bowl eligible! Well ............. it was a good game and got a little scary at the end. I'll root for your guys in the future! QUACK ATTACK ... Way to go Klaas, The Ducks were unstoppable. Personally, I did not think that FSU had a chance against Oregon. The Ducks keep their foot on the gas at all times, FSU has barely won all year is a bad conference. Let alone, it took a questionable last second offensive pass interference call against ND to keep Florida St undefeated. Even thought FSU was undefeated, I did not think they were even in the top 5 in college football. When I say FSU play the same game they had all year, behind at half and thinking they would pull it out in the second half, I knew the game was over. The Ducks did not disappoint, the cleaned their clocks. 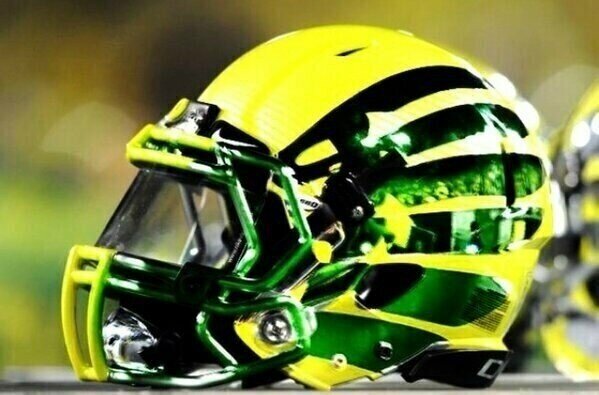 I am taking the Ducks over Ohio St in National Championship game. FSU was out of shape. That's one thing the Ducks have over most of the others is conditioning. I think Ohio State is in better shape than most and could give the Ducks some problems. By tomorrow night we'll know! Congratulations to Ohio State and the Big Ten for the first playoff National Championship. Without a playoff system they never would have played for the NC. Two very hard fought games at least they didn't end with plays like the Detroit Dallas game and Dallas Greenbay games. Where off to the Super Bowl NFL games now. Of the 4 left I would pick the Patriots slightly over Seattle. At least the last 4 teams are pretty good. I agree it was a triumph to have a NC with two teams that could never have played in the NC against each other until the big game changed. Son is at the coach's convention hoping to make the right connection for his next position, happy to say his team made the top 25! From the bottom of the barrel in 2014 to the top 25 (at least on one list) - more than a miracle just due to all the hard work of many this required. The better team won the National Championship, congrats to Ohio State for a well played game! Marcus Mariota officially declares for the 2015 draft. I wish the very best for him. I will root for whoever he ends up playing for. I wonder how long it will be before PSU brings back Joe Pa’s the statue? This settlement certainly does not diminish the heinous and despicable actions of Jerry Sandusky and his sexual abuse. What it does is put the NCAA in its place once again and their over-reach of authority and reputation destroying. The NCAA got their hand slapped as well with the Miami football scandals too. I can only hope the victims affected by the POS Sandusky can live their lives in peace. Today is a great victory for everyone who has fought for the truth in the Sandusky tragedy. The repeal of the consent decree and the return of the wins to the University and Joe Paterno confirm that the NCAA and the Board of Trustees acted prematurely and irresponsibly in the unprecedented sanctions the NCAA imposed on the University, the players, coaches and the community. This case should always have been about the pursuit of the truth, not the unjust vilification of the culture of a great institution and the scapegoating of coaches, players and administrators who were never given a chance to defend themselves. For nearly three years, everyone associated with Penn State has had to bear the mark of shame placed upon the institution by the NCAA. It was a grievously wrong action, precipitated by panic, rather than a thoughtful and careful examination of the facts. Fortunately, through the tenacious efforts of Senator Jake Corman and Treasurer Rob McCord, a large measure of the wrong has been righted. This is a major victory in our continued pursuit of justice for Penn State. The victims deserve the truth as do those who have been smeared by the deeply flawed Freeh report, which served as the basis of the actions by the Board Trustees and Penn State. Through our pending litigation, we intend to continue the job of uncovering the full truth in this case. 1. The 12th Man - No team in the NFL has a greater home team advantage that the Seahawks. The rabid fans and noise level is unbelievable. This will hardly be the friendly confines of the 'Frozen Tundra' and Lambeau Field for Aaron Rodgers and the Pack. 2. The Legion of Boom is back - The Seattle secondary had many injuries in the beginning of the season; however, they are now healthy and back in a big way. Cornerbacks Byron Maxwell and Richard Sherman and safeties Kam Chancellor and Earl Thomas are all playing their best when it counts. They have shut down everyone down the stretch. 3. Bobby Wagner (Middle LB) - He is healthy and easily the best MLB in the league, just ask Peyton Manning and the Broncos. His speed and ability to cover backs and TE's in stellar. 4. RB Marshawn Lynch - He is the inspirational leader of the offense and the beast is completely respected and appreciated by the hard hitting Seattle D. If the "Beast" is released, it will be a long, long day for Green Bay. 5. Kam Chancellor - He is the best safety going and can hit like a freight train. His athletic ability is beyond words. Look for him to hurdle the offense line again and block a FG if the chance arrises. 6. QB Russell Wilson - He just wins. There is nothing pretty about it at times, but he just wins. 7. The No-name Seattle WR's - Baldwin, Kearse and Lockette have been continually dissed by pundits as average and pedestrian. Really? Why is it then, that when matched up against what is considered better WR tandems and trios, they perform better and make bigger plays? 8. Green Bay QB Aaron Rodger's injured calf - Seattle defense ain't Dallas. Sorry, but it is hard enough to go into CenturyLink Field when one is healthy and come away with a victory. However, when part of your game is being mobile in the pocket and extending plays with your legs and you have a partially torn calf muscle ... GOOD LUCK. Summary: The only real shock that the Packers have is a punchers chance, meaning the unexpected and unforeseen like turnovers, blocked kicks and injuries. Also, the Packers must rely on a running game and get at least 150 yards on the grown to win. Aaron Rodgers showed us all that he was a warrior last week and deserves the league MVP, but Seattle is not Dallas. Why the Cowboys did not pressure hm more on one leg was a kin to Game 6 on the American League Championship series between the Red Sox and Yankees, the famed "Bloody Sock" game when Schilling pitched on one leg with a torn tendon sheath in his right ankle, the Yankees never once bunted. The key to the game is that if Seattle can get pressure with their front 4 or blitz a LB or two and cause Rodgers to hesitate and come off his first read, the game could get really ugly. Make no mistake out it, the Seahawks secondary is the best in the business. If Rodgers has to go to his second, third or fourth reads in passing plays, he will be sacked all day or throwing the ball away. That being said, Seattle has too many freaks on defense for Rodgers and the Pack. Many are predicting a close game, I just don't see it. I would be stunned if Seattle loses this game and shocked that it is not a 14 points spread. The Green Bay Packers and Seattle Seahawks square off at CenturyLink Field in Sunday's 2015 NFC Championship Game. The game time is set for 12:05 p.m. PT, with the winner advancing to Super Bowl XLVIII. The Seahawks are 7.5-point favorites. WOW ... I still cannot believe the Seahawks pulled this one out of their hat. They pretty much did nothing all game long until 4 minutes left in the game. All of a sudden they turned into the team on offense that we expected to see all game long. Great photos at the following link. The Seattle Seahawks are heading back to the Super Bowl after defeating the Green Bay Packers, 28-22, in the NFC Championship Game on Sunday at CenturyLink Field in Seattle. I know what you mean Red. Hubby and I were watching the game ... the game I cannot comprehend ... over at youngest son's home. There was a vested interest in the outcome. A deal was made. Son's American FIL would treat everybody our for dinner if the Seahawk's won and ... hubby would pay if the team lost. I slipped home about an hour ago get some cash ... believing the Seahawks were losing. About 15 minutes ago I turned on our TV ... the Seahawks had won!!! YES!!! Sorry we didn't come ready to play. That's what happens when you play quality opponents and don't come prepared. I like OSUs Frosh QB. Looks like the Cowboys will be in good hands for years too come. I'm on to Back2Back Super Bowls with my Seahawks. Hoping we can bring another one home to the Emerald City. Maybe your fellow OSU alum, Russell Okung, can bring another ring to the locker room in Stillwater. Starting off 2015 with a Super Bowl, after graduating from The University of Washington in December. Life is good in Seattle! Hope all is well with the Monkey's. I am a long time PATS fan who used to have season tickets at the old Shaffer Stadium, aluminum bleachers and all, LOL. Seattle is a very good team, I am hoping that The PATS have returned to a team more like the balanced ones they used to have where they won 3 Super Bowls. Vegas has this game as a pick 'em. Can't get any more close than that. Let me first qualify this that I am a die-hard New England Patriot fan from the days of Sam “Bam” Cunningham, Steve Grogan, Irving Fryar, Stanley Morgan, Craig James, Mosi Tatupu, Randy Vataha, the late Darryl Stingley, Russ Francis, John Hannah, Mike Haynes and to one of my all time favorites Sam Adams. To more recent players like Ben Coates, Richard Seymour, Mike Vrabel, Willie McGinest, Tedy Bruschi, Lawyer Milloy, Ty Law, Rodney Harrison, Adam Vinatieri, Joe Andruzzi, Troy Brown, Randy Moss and Drew Bledsoe. To today’s cast of Patriots like Tom Brady, Julian Edelman, Rob Gronkowski, Nate Solder, Rob Ninkovich, Vince Wilfork, Devin McCourty, Chandler Jones and LeGarrette Blount. Football games are made up of offense, defense, special teams and intangibles. Games like the Super Bowl generally multiply the importance of intangibles like turnovers, sacks, penalties and bad calls by referees. Congrats to Seahawk fans, this Super Bowl was truly special. Two great teams battled for 60 minutes. All Super Bowls should be like this. It was as close a game as the odds makers said it would be. Trust me, to Seahawk fans, I know how losing a game like this is. The PATS would have two more Lombardi trophies if it were not for two plays, a BS catch by David Tyree and a non-catch by Wes Welker. I am glad the refs let them play and the game was decided on the field. Still cant believe that the Seahawks did not run Lynch from the 1, but I will take it. No comments on deflategate even??? Big week in college football - I was remembering GO since Wisconsin plays Bama today. Made son's season opener two weeks ago, he's now offensive coordinator for one of the largest high school programs in the southeast and they started out with a big win over another big program 39-27. Repeated a win last night of 49-0 but against a smaller opponent. Where is Frijole??? Has anyone heard from her? Hope your fave teams have great wins today!!! Page created in 6.247 seconds with 19 queries.